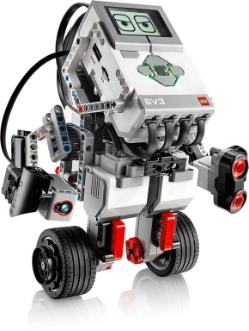 LEGO Education unveils the latest generation of its Mindstorms robotics education platform today: the EV3. LEGO Education says that it’s made a number of changes to the platform based on feedback from teachers and students. One of the main issues it addressed: how to make the technology less daunting to new users and how to get learners up and running on the platform quickly. It contends that students can build and program a robot in a single 45-minute class. Designed for use in the classroom, the Education version of the Mindstorms EV3 software includes a customizable curriculum (some 30 hours of instruction about engineering and design), a way for teachers to track and assess students’ work, as well as a digital workbook for students to utilize to track their own projects and submit assignments. "Under the hood" of the EV3, the new brick has more built-in memory, expandable memory, and a faster processor. The EV3 kit includes a gyro sensor in lieu of the NXT’s sound sensor. Importantly for schools, the EV3 also boasts backwards compatibility with previous generations of Mindstorms — in terms of the bricks (something that was an issue in the past when Mindstorms switched from LEGO bricks to Technix -- the EV3 works with all LEGOs), as well as the cables, motors, and sensors from older kits. The EV3 software will be able to program older bricks, and LEGO Education says it will continue to support the NXT platform too. The EV3 is available for preorder now and will ship this fall. It’s CES in Las Vegas this week, so the tech news will be full of the latest gadgetry (and plenty of vaporware). As such it’s worth a cautionary note here: sometimes we’re so busy looking for the “next big thing” in (ed-)tech – the new and the shiny and the disruptively innovative – that we forget to consider the old, the reliable, and the beloved, and as I’ve argued again and again, we neglect to remember much of (education-)technology’s history. Indeed, that word “Mindstorms” had better ring a bell for you. It’s the best line from Bret Victor’s esssay “Learnable Programming”. It’s the title of a book that, as Victor insists there, you must read. That book was first published in 1980 by computer scientist and educator Seymour Papert, and LEGO Education's robotics platform is named for it. Papert was at the MIT Media Lab in the mid–1980s when LEGO contacted him about helping to make LEGOs and the creations kids build controllable. To program these, LEGO and the Media Lab created a special version of Papert’s Logo programming language. LEGO Logo was a precursor to the Mindstorms platform. The design of LEGO Logo and by extension of LEGO Mindstorms reflect Papert’s constructionist theories: we learn by making and building with others. It’s easy, I suppose, to label the Mindstorms EV3 as a great tool for “learning STEM" and stop there. But this legacy here -- the connection to Papert and constructionism -- is significant. The design of the hardware and the software and ideally in turn the exploration these foster in the classroom, are all about — as the quotation at the top from Papert makes clear — constructing knowledge by building something meaningful. It isn't simply that students learn to program or learn engineering; it's how they do so that also matters.